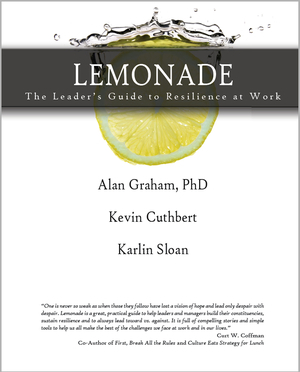 How do leaders deal with the lemons of difficult circumstances and make lemonade? Lemonade is a user-friendly guide to the key qualities that can help leaders and their teams to bounce back from change and challenge. Included are a self-assessment of your own resilience at work, stories of leaders just like you who have triumphed in difficult times, and practical exercises and activities that you can put to work for you. Alan Graham, Ph.D. is the President of ACP Consultants. As an executive coach, Alan works with leaders at all levels to develop their unique strengths and personal resilience. He also specializes in ADD/ADHD in kids and adults, and helps high performance ADD executives to focus and excel. Dr. Graham works with the American Psychological Association to deliver the Psychologically Healthy Workplace Awards and enjoys helping organizations to become happier, healthier places to work. Kevin Cuthbert is the Chief Consulting Officer at Interaction Associates. In his twenty-plus years in business, he has served on international boards, and has created and led worldwide Human Resources functions. He has served as a consultant and coach to large global organizations, and contributed to the bestselling business book, First Break All the Rules. He works with organizations to energize and involve their work forces, to build the leadership pipeline, and to empower leaders to excel. ​Karlin Sloan is the CEO and founder of Karlin Sloan & Company, a leadership development consultancy devoted to helping leaders to be the change they wish to see in the world. She has helped organizations worldwide to develop clearer, more effective communication, enhanced teamwork, and powerful leadership in times of growth and change. She is the author of the acclaimed business book Smarter, Faster, Better, which has been translated into Thai and Russian, and Unfear: Facing Change in an Era of Uncertainty. PURCHASE PAPERBACK BOOK FROM AMAZON! PURCHASE KINDLE BOOK FROM AMAZON!